What better way of bringing your work colleagues or friends together than a Corporate shooting event!! The Bronze Clay Shooting package is for a minimum of 2 people and is ideal for Stag/Hen Parties, Corporate Entertainment, Birthday Parties, or for a group of friends wanting a great day out in the Manchester – Liverpool area. Ear and Eye protection, (please bring a baseball type cap, wellingtons or boots). No food or beverages are included with this package, however, catering facilities are available on site. Our Catering Manager will be happy to discuss any individual or specific requirements that you may have. Subject to your group size, your day will last approximately 1.5 - 2.5 hours from start to finish, and can be custom designed to fit your needs perfectly. You may bring alcohol for after the event. It must be lodged with our catering manager on arrival; but the consumption of alcoholic beverages prior to or during the shooting is strictly prohibited. The Rixton & Astley Shooting days are great fun and offer an extremely cost effective way to spend a great day with us, learn a new skill and enjoy. Unlike some grounds offering similar packages, all of our coaches have passed shotgun coaching qualifications. All are CRB checked, and the majority are BASC Accredited Shotgun Coaches which is generally considered as the Gold Standard. All of our coaches are very experienced shooters. You will be in the safest of hands from start to finish. We do reserve the right for our coaches to immediately terminate a clients lesson should their conduct fail to meet our standards. We currently only offer our corporate packages on Sundays as per our diary (please click here to see dates). We will consider other days subject to group size and your specific requirements, please ask. Click here to book now or give us a call on 07785995526. A non refundable deposit of £20 per person is required at the time of booking. Use of our small marquee prior to or after the shooting session from £35 per hour. The Silver Clay shooting package is for a minimum group of 2 people and is ideal for Stag - Hen Parties in the Manchester – Liverpool area, Corporate Entertainment, Birthday Parties, or for a group of friends wanting a great day out. Ear and Eye protection, please bring a baseball type cap, wellingtons or boots. Trophies for 1st place ( 2nd and 3rd place trophies for bookings over 15 people - additional trophies or prizes can be arranged) at your specific request. Breakfast Bap with bacon, sausage, egg, any combination on arrival. Unlimited Tea and Coffee or Bottled Water throughout the day. For the more discerning we have an arrangement with a local hotel who can offer a wide range of catering and and other facilities to complete your day, please let us know what you require, we will do our utmost to make it happen. Subject to your group size, your day will last approximately 2 hours from start to finish, and can be custom designed to fit your needs perfectly. You may bring alcohol for after the event, it must be lodged with our catering manager on arrival; but the consumption of alcoholic beverages prior to or during the shooting is strictly prohibited. Unlike some grounds offering similar packages, all of our coaches have passed shotgun coaching qualifications, all are CRB checked, and the majority are BASC Accredited Shotgun Coaches which is generally considered as the Gold Standard. All of our coaches are very experienced shooters, you will be in the safest of hands from start to finish. We do reserve the right for our coaches to immediately terminate a clients lesson should their conduct fail to meet our standards. To book or if you require any further information please give us a call on 07785995526. 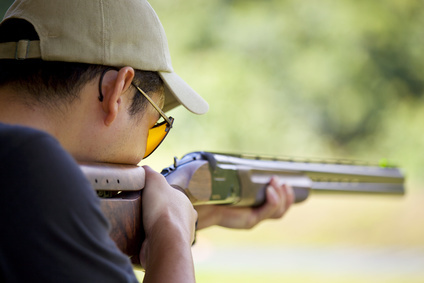 The Gold Clay shooting package is for a minimum group of 2 people and is ideal for Stag - Hen Parties in the Manchester – Liverpool area, Corporate Entertainment, Birthday Parties, or for a group of friends wanting a great day out. Selection of sandwiches, wraps and pastries at half time. Subject to your group size, your day will last approximately 4 hours from start to finish, and can be custom designed to fit your needs perfectly. You may bring alcohol for after the event, it must be lodged with our catering manager on arrival; but the consumption of alcoholic beverages prior to or during the shooting is strictly prohibited. To book or if you require any further information or references from previous clients please give us a call on 07785995526.